Nearly 49,000 prospective undergraduates – the most ever – have applied for admission to the University of California, Santa Cruz for the fall 2014 quarter. Data released today by UC's Office of the President show that UC Santa Cruz attracted a record 40,687 applications from high school seniors and 8,162 applications from transfer students during the university's November "priority" filing period. All undergraduate applications for fall admission total 48,849. Applications to UCSC showed increases across many different demographics. California resident applications for freshman enrollment again totaled the most ever–34,542–and represent 84.8 percent of all frosh applications. Out-of-state and international applicants increased sharply and to all-time highs as well: up 45.9 percent to 3,619 from international students and up 28.7 percent from out-of-state students to 2,526. UCSC ranks second in the world for the impact of its research as measured by the average number of times its faculty's published work is cited by scholars around the world, according to a survey published by Times Higher Education. The campus is also ranked seventh overall in the world among universities founded within the last 50 years. “Our faculty, students, staff, and alumni should share in the celebration of these application numbers,” McCawley said. "Prospective students and their families often come into contact with members of our campus community and our alumni, and because of those interactions, they decide to apply." Faculty and staff are already making preparations to welcome the new class into our distinctive residential colleges, first-year Honors Program, Challenge Program, and provide ever-expanding opportunities for undergraduate research, internships, and creative projects with UCSC's world-class faculty. Close to half of the applications for fall 2014 from California high school seniors–47.2 percent–came from students who are considered “first generation,” where neither parent has a four-year college degree. The percentage of first-generation applicants represents an increase over last year’s 46.7 percent and 43.9 percent in 2012. Academic quality of first-year applicants remains high, consistent with the last several years. Ethnic diversity of California applicants also increased. The campus saw year-over-year increases of African American first-year applicants (5.2 percent of all freshman applications); Chicano/Latino (33.8 percent); and Asian American (30.2 percent). McCawley noted that increasing the geographic diversity of the campus’s undergraduate students is also an important goal for UCSC. UCSC expects to enroll 3,650 new first-year students and 1,200 new transfer students in fall 2014, representing slight increases over fall 2013 enrollment targets, McCawley said. 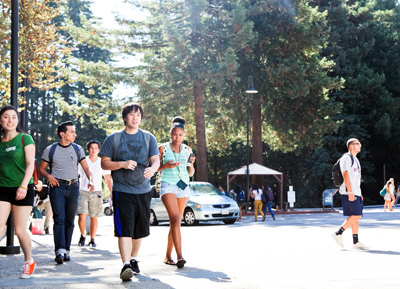 Undergraduate applicants to UCSC will be notified of admission decisions beginning mid March. Admitted freshmen will have until May 1 to indicate their intention to enroll at UC Santa Cruz. The deadline for transfer students is June 1.